When someone mentions Florida people often think of sun kissed oranges and sandy beaches. It might come as a surprise that this home, located on Choctawhatchee Bay, is surrounded by more oak trees than palms. This coastal home has been in the owners’ family for three generations and each day it has boasted spectacular views of the bay from one sunset to the next. The scenic vistas were the primary inspiration for the home’s design — they created the desire to incorporate the beauty of the great outdoors in the home’s interior. Patrick Ballasch, Principal, DAG Architects aimed to create a light and airy space so that the homeowners could retreat into the comfort of their own home while still experiencing the peaceful tranquility of the sky and sea. See how the architect used the inspiration of the Emerald Coast to create this light infused home. DAG Architects’ top priority was to maximize the views of the bay throughout the residence. This was accomplished by increasing the width and height of the windows and strategically placing mirrors to elongate the views. They wanted the breathtaking surroundings to envelop the onlooker from every room in the home – including the bathrooms. Patrick had the mirrors in the bathroom detailed like windows and positioned so that when the viewer looks into them they also see reflections of the bay. The mirrors also magnify the light bouncing off of the water; dazzling sunshine and ocean views seems to flow from the outdoors in. Along with the strategically placed mirrors numerous white walls were incorporated to provide a surface for the natural light and color accents. The goal was to have each room contain “three sides of light” and to fill the space with an abundance of sunshine and warmth. The windows, skylights, and mirrors created an inviting space where guests were sure to immediately feel at ease and welcome. With jaw dropping views and abundant natural light, the only things now missing from the home were the waves of the water and the sky itself. 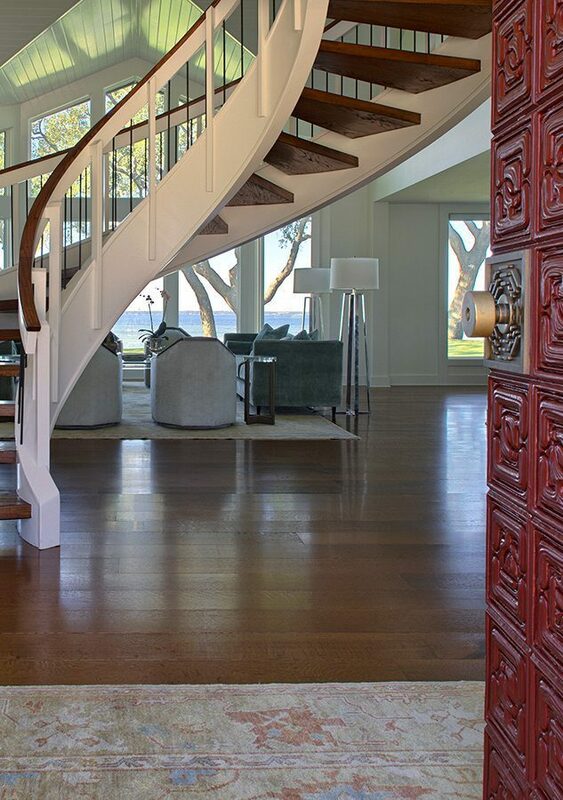 DAG Architects took the design to the next level by incorporating the colors of the Emerald Coast into the home. A backdrop of white provided a clean contrast for the sea foam greens and sky blues and also served to reflect the natural light. The entire house came alive. It was as if the interior color palette married the home to the views of the gulf and there was now a seamless transition of light and color that flowed from the exterior environment straight into the heart of the home. The delicate balance of cool greens, blues and whites needed to be balanced by some warmth to prevent the space from becoming too cool and sterile. It was important to the homeowners that the home be timeless, warm, and welcoming for generations to come. Patrick warmed it up with a light coffee colored wide plank wood floor. The wide widths and long lengths of the planks reinforced the light and airy open space, unified the home and tied all of the rooms together. It was critical that the color of the floors was just right in order to balance out the cooler tones of the home. He worked closely with Carlisle’s custom sample shop to handcraft an assortment of samples to make sure the color was complimentary to the design. It couldn’t be too dark – too light – too red – or too yellow – for fear of throwing off the color scheme. It needed to complement the natural hues found in the bay and throughout the house. The darker undertone of the wood paired with the custom stain color balanced out the color palette and added the perfect touch to the living space. The home was then able to pay tribute to its surroundings, the inspiration all along. The end result was an interior space that authentically represented the peace and serenity of life at the water’s edge. Rift and Quartersawn White Oak flooring was chosen to run throughout the kitchen, bathroom, bedrooms, and living space. Rift and Quartersawn planks are an extremely unique cut in flooring design. Unlike plain sawn flooring, which is also called flat sawn, where the entire log is cut into planks, Rift and Quartersawn flooring only uses a “quarter” of the log. This technique yields a very different visual as it eliminates the cathedral or arched grain in the middle of the board and leaves only the straight lines of vertical grain. Although many people like the cathedral pattern prevalent on the face of the plain sawn boards, the refinement and stunning straight grain pattern of Rift and Quartersawn flooring is often used to create a more refined aesthetic. The home’s location on the water, paired with Florida’s humid environment, might cause some to speculate that narrow strip planks would have been a safer bet for installation, but Patrick knew he could trust Carlisle and had the confidence that our craftsmen would deliver what was needed for the project. The 8”-wide planks came from hand selected timber that had been air- and kiln-dried and then precisely milled by our finest artisans — known for handcrafting wide plank floors for over 50 years. In addition to the lumber quality, experience and true craftsmanship that Carlisle provided, technical specifications like an 11-ply Baltic Birch substrate, a 3/16” wear layer, and back-sealed planks resulted in a product well suited for humidity and a coastal bay environment. Whether your project is located on the water, in the mountains or desert, or in a high-rise city building Carlisle can handcraft a work of art just for you. Fashion meets function when our stunning wide plank floors elevate the aesthetic of your interior design and increase both the quality and investment value of you home or business. Contact us today to discuss your dream floor and let us handcraft an assortment of samples uniquely for you. DAG Architects was established in 1981 and over the past 35 years has grown and undertaken a tremendous variety of projects throughout the Southeast. They provide in-house including architecture, visioning and programming, master planning, interior design, graphic design, and construction phase services. The firm’s work has been recognized with numerous design awards, and the principals and key professionals have been active in community, state, and national affairs relating to architecture and construction. In 2007, DAG Architects was awarded the Firm of the Year for the State of Florida. This honor is given in recognition of outstanding achievement in design, community service, education, and service to the profession and the AIA by an architectural firm. For more information visit their website or call 850/337-6441.